Gif2led released, and with AVR LED Egg demostration! We have worked on LED matrix for so many times, but mostly for text scrolling, so how about make some animations on it? But we are too lazy to make the animation patterns to the C header file in an array of bytes. 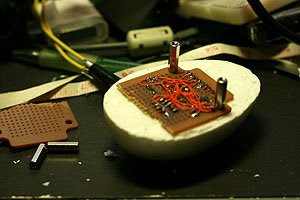 We finally finished one tool may be useful for all led matrix lovers! 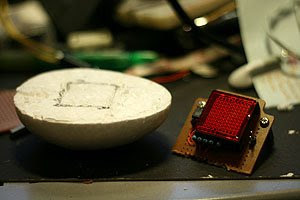 Let start with our demonstration, the project is called LED Egg, it is based on a 10x10 matrix (but we only use 10x8 in our case) with an Egg case to hold the circuit board. Noted that the frame 0 (marked as CAL above) is a special frame, which used for calibration. When used with gif2led tool, the frame 0 is the pattern of your led matrix with all led ON. 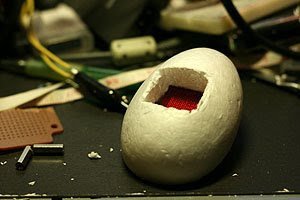 So Lets add an egg case, the egg is made from pu foam plastic, it is used for Easter decoration. Philips LED Lamp Featuring 16M colors! Wow, philips worked on many LED products recently, and here we have a LED lamp for your living room. May be someone can use for some art projects. The controller is very cool, it is a touch wheel and you can change and set the color easily. May be you can try to set the color to reflect your mood everyday. Enjoy. ﻿﻿Arduino is an easy to use AVR platform, you can program it easily using serial port, and power it up with USB. With a very nice IDE and cool user library. The Propeller chip makes it easy to rapidly develop embedded applications. Its eight processors (cogs) can operate simultaneously, either independently or cooperatively, sharing common resources through a central hub. The developer has full control over how and when each cog is employed; there is no compiler-driven or operating system-driven splitting of tasks among multiple cogs. A shared system clock keeps each cog on the same time reference, allowing for true deterministic timing and synchronization. Two programming languages are available: the easy-to-learn high-level Spin, and Propeller Assembly which can execute at up to 160 MIPS (20 MIPS per cog). It is a powerful embedded processor from Parallax Inc, a well known embedded processor "PIC" inventor. With 8 cores, and total about 160MIPS processing power, you can do many amazing projects. You can see the above video involved many image processing! Adding an Ethernet chip, now you can access the internet cloud with a microprocessor that's capable of running a TCP/IP stack. This ybox2 can fetch information like weather, news from the internet and display it on TV which let me think of chumby widget devices.